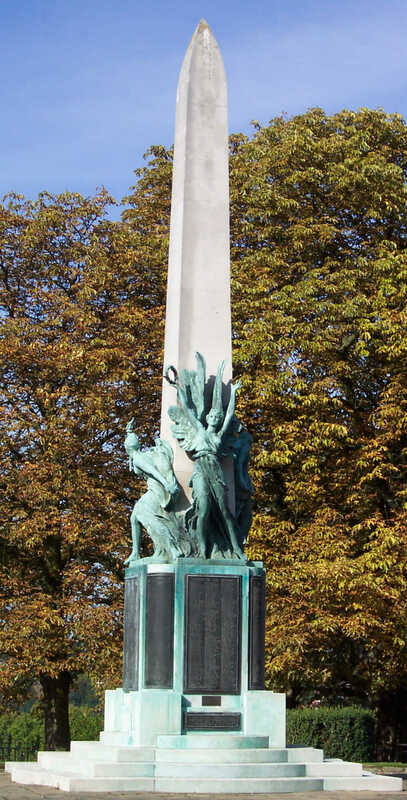 The Bromley War Memorial, situated at the top of the hill in St Martin’s recreation ground, was unveiled on 29th October 1922 by Lord Horne, G.C.B., K.C.M.G. and dedicated by the Bishop of Rochester John Reginald Harmer DD. The Portland stone pedestal is 27 feet 6 inches high. The three figures in cast bronze represent “Victory” in the front, “Liberty” on the left and “Sorrowful Remembrances” on the right. The memorial was designed and modelled by Sydney March, sculptor, and the bronze castings we executed by Messrs March Bros. of Farnborough. There are four main panels in bronze with a total of 858 names raised in letters. An additional panel with 14 names was added at a later date. In 1949 side panels were added to commemorate the fallen of WW2. On 29th January 2018 the name of Lieutenant Commander Geoffrey White V.C. was added in the form of a stone in front of the memorial. During the research it has become clear that, for whatever reason, there are many more whose names are not listed. Last updated 1st July 2018.